Order the mouth-watering cheese curds at Dlux on the square. Give your taste buds the experience of a lifetime for only $8. Head on over to AJ Bombers and make the pressing decision between Poutine (fries with cheese curds and gravy) or opt for the traditional cheese curd. If the beer battered options aren’t quite hitting the spot, Graze’s vodka battered cheese curds will do the trick! No. 13 is all you need to know when you head to The Old Fashioned. That lucky number will score you a wicked plate of their beer battered cheese curds. You might not have room for anymore food after you scarf down the Great Dane’s one half pound cheese curds. Paired with a side of roasted hatch green chili crema on the side, this app is incomparable. 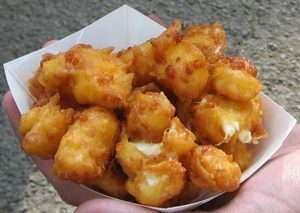 For those late nights on State Street, I have the ultimate cheesy craving fulfillment: the Fried and Fabulous food cart! Walk up for some deep friend mac n’ cheese bites or opt for the traditional cheese curds–either way, you can’t go wrong. With an overwhelming amount of night life cheese fixings at your finger tips, I am sure you’re in a tizzy! Thankfully, you’ll have semester after semester to try them all!